Al-Abri M, Al-Hamhami A, Al-Nabhani H, Al-Zakwani I. Validation of the Arabic Version of the Epworth Sleepiness Scale in Oman. Oman Med J 2013 Nov; 28(6):454-456. The Epworth sleepiness scale (ESS) is a self-administered eight-item questionnaire that was developed by Johns,1 as a tool to measure subjective sleepiness in adults. The scale has been found to be reliable for measuring persistent daytime sleepiness,2 and can show differences with treatment and time.3 It does not, however, differentiate between different causes of sleepiness.4,5 The patients were asked to score themselves on a self-rating scale totalling from 8 ratings of 0-3, each depending on how easily they would fall asleep in a specific situation. The overall score ranges from 0-24: the higher the score, the sleepier the individual.6 This questionnaire has been translated and validated into different languages including Spanish,7 Greek,8 and Chinese.9 Most of the studies that have validated ESS in different languages used Cronbach's alpha to test for the internal consistency. However, none of these studies have used the Bland-Altman plot,10,11 to test for compatibility of the translated version with the original English version. Furthermore, in this study, healthy subjects were selected compared to other studies in which patients with obstructive sleep apnea were included. However, the ESS instrument has yet to be translated into Arabic and validated in an Arabic speaking population. Hence, the aim of this study is to test for validity and reproducibility of the ESS in an Arabic speaking population using the Bland-Altman plot. This study was conducted at the Sleep Medicine unit, Sultan Qaboos University Hospital, Oman, between May and October 2008. The participants were contacted through the email system or the out-patient clinic. Inclusion criteria included healthy adult men and women (aged 18-75 years) with fluency in both Arabic and English languages. The subjects were supposed to be free of any stigmata of obstructive sleep apnea/hypopnea syndrome or other sleep disorders. The ESS self-administered eight-item questionnaire was used as a tool to measure subjective sleepiness in adults. The original English version of the scale was translated into an Arabic version (AESS) and then back translated into English to check its accuracy. The volunteers were asked to score on a self-rating scale totalling from 8 ratings of 0-3, each depending on how easily they would fall asleep in a specific situation. They initially completed the English version of the ESS questionnaire, followed by the AESS version and then vice versa in a random method. The study protocol was approved by the Ethical Committee at Sultan Qaboos University, and subjects gave informed written consent. Descriptive statistics were used to describe the data. For categorical variables, frequencies and percentages were reported. For continuous variables, mean and standard deviation were used to summarize the data. Lin’s concordance correlation coefficient,12,13 aided with Bland-Altman plot were used to test the agreement between the Arabic and English versions of the ESS. A priori two-tailed level of significance was set at the 0.05 level. Statistical analyses were conducted using STATA version 12.1 (STATA Corporation, College Station, TX). Concordance correlation results revealed a substantial concordance (rho_c) of 0.914, but one that did not reach 1 (95% CI: 0.881, 0.947). This may have resulted from both the lack of perfect correlation (Pearson’s r = 0.914) and bias (C_b = 1.000), (Table 2). The reduced major axis revealed a slope of just over one with a slight negative intercept. The concordance plot in Fig. 1 supports this assessment, as it shows that the line is very close to the perfect line of concordance. 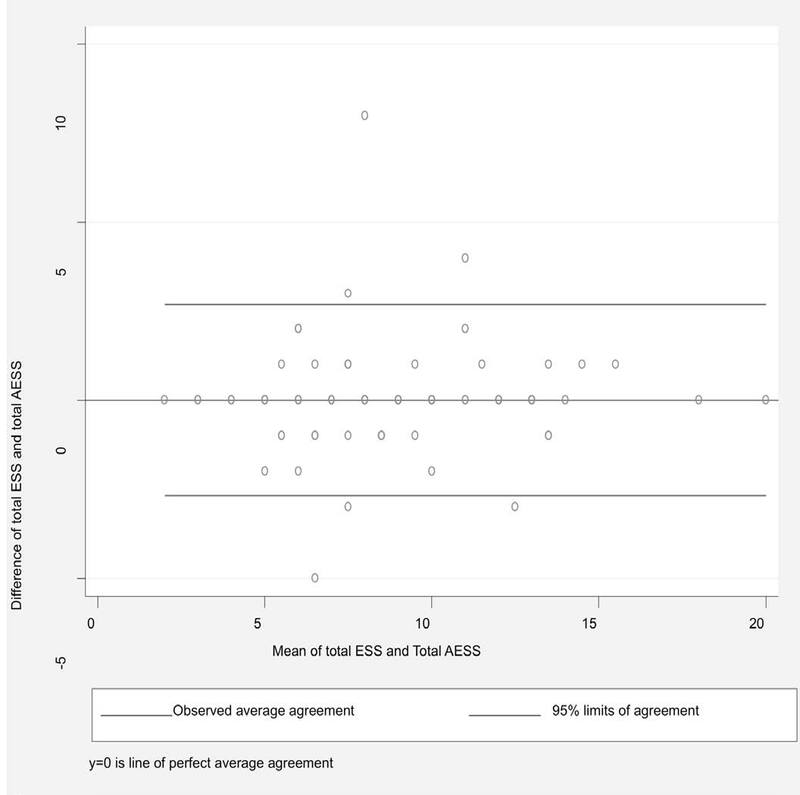 Furthermore, Bland and Altman’s limits-of-agreement measured at 0.000 (95% CI: -2.684, 2.684) indicating insignificant average departure from agreement. Fig. 2 shows that all these results indicate an agreement between the two versions of ESS (English and the Arabic). Figure 1: Concordance correlation coefficient. Figure 2: Limit of agreement. This is the first study looking into the validity of the Arabic version of the Epworth sleepiness scale (AESS). Similar studies have been conducted to validate ESS in different languages; however in this study, Bland Altman was used to test for validation and measure the agreement between the two versions of the ESS. Other studies used Cronbach's alpha to test for internal consistency. Furthermore, the participants were healthy subjects in this study, contrary to other validation studies and that may have eliminated the variation of scoring among subjects suffering from sleep disorders such as obstructive sleep apnea and narcolepsy. In a study by Beiske et al.14 ESS was validated in patients with obstructive sleep apnea and that may have created variability in the subjects’ responses. A similar study by Izci et al. tested a Turkish version of the ESS by using Cronbach's alpha, and Spearman correlation was used to test for interclass variability.15 The study by Izci et al. was conducted on both patients and healthy controls and that may not be an inappropriate selection with variation of scoring among patients. A majority of these studies were conducted in patients and used different statistical methods to determine the validity of the scale in different languages. However, none of the previous studies used Bland-Altman test or plot to examine the compatibility of English ESS with any of the languages that the ESS was translated into. Bland and Altman (1986) proposed a method consisting of two measurements on a group of subjects, and then plotting the difference scores against the mean for each subject. 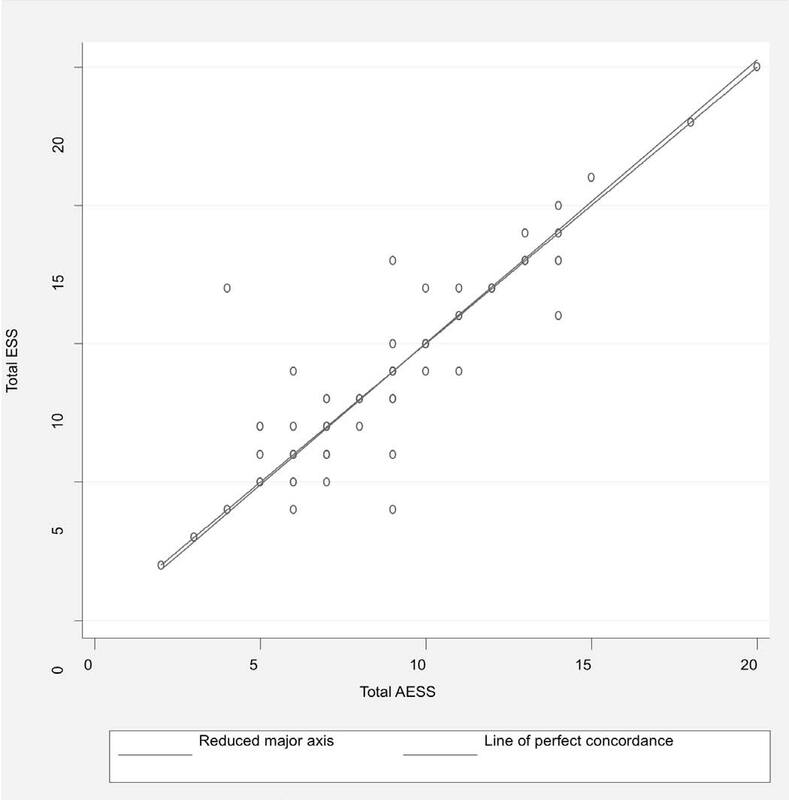 Bland-Altman proposed their plot to discourage researchers away from the misuse of applications of the correlation coefficient between these two measurements as a measure of validity. The Bland-Altman method calculates the mean difference between two methods of measurement, and 95% limits of agreement as the mean difference (2 SD [or 1.96 SD]). It is expected that the 95% limits include 95% of differences between the two measurement methods. The plot is called a Bland-Altman plot and the associated method is usually called the Bland-Altman method. The Bland-Altman method may include estimation of confidence intervals for bias and limits of agreement, but these are often not mentioned in published papers. The problem with the correlation coefficient is that the two measures might be highly correlated, yet there could be substantial differences in the two measurements across their range of values. This study had limitations which included the small sample size; the subjects had not undergone full sleep study to rule out sleep breathing disorders and they were only selected using a questionnaire. Furthermore, the participants were relatively young (mean age was 28 ± 9 years) and this might have created an argument that the AESS was mainly tested in young subjects. Nevertheless, only 40% of the participants were students and only a small proportion of the participants reported severe snoring (4%). The Epworth Sleepiness Scale is a validated tool to objectively evaluate daytime sleepiness. It has been used for years as a screening tool for patients attending sleep clinics. It has been translated into different languages throughout the world. This study was conducted to validate the Arabic version of Epworth Sleepiness Scale (AESS). There may be more than one Arabic translation of the ESS but none of them were validated with the English version. This study was conducted among Arabic speaking population in Oman with fluency in both languages and was tested using the Bland-Altman plot. The results indicated the validated Arabic ESS questionnaire was just as good as its English counterpart. 1. Johns MW. A new method for measuring daytime sleepiness: the Epworth sleepiness scale. Sleep 1991 Dec;14(6):540-545. 2. Johns MW. Reliability and factor analysis of the Epworth Sleepiness Scale. Sleep 1992 Aug;15(4):376-381. 3. Hardinge FM, Pitson DJ, Stradling JR. Use of the Epworth Sleepiness Scale to demonstrate response to treatment with nasal continuous positive airways pressure in patients with obstructive sleep apnoea. Respir Med 1995 Oct;89(9):617-620. 4. Johns MW. Daytime sleepiness, snoring, and obstructive sleep apnea. The Epworth Sleepiness Scale. Chest 1993 Jan;103(1):30-36. 5. Johns MW. Sleepiness in different situations measured by the Epworth Sleepiness Scale. Sleep 1994 Dec;17(8):703-710. 6. Johns MW. Daytime sleepiness, snoring, and obstructive sleep apnea. The Epworth Sleepiness Scale. Chest 1993 Jan;103(1):30-36. 7. Chiner E, Arriero JM, Signes-Costa J, Marco J, Fuentes I. [Validation of the Spanish version of the Epworth Sleepiness Scale in patients with a sleep apnea syndrome]. Arch Bronconeumol 1999 Oct;35(9):422-427. 8. Tsara V, Serasli E, Amfilochiou A, Constantinidis T, Christaki P. Greek version of the Epworth Sleepiness Scale. Sleep Breath 2004 Jun;8(2):91-95. 9. Chen NH, Johns MW, Li HY, Chu CC, Liang SC, Shu YH, et al. Validation of a Chinese version of the Epworth sleepiness scale. Qual Life Res 2002 Dec;11(8):817-821. 10. Bland JM, Altman DG. Statistical methods for assessing agreement between two methods of clinical measurement. Lancet 1986 Feb;1(8476):307-310. 11. Bland JM, Altman DG. Comparing methods of measurement: why plotting difference against standard method is misleading. Lancet 1995 Oct;346(8982):1085-1087. 12. Lin LI. A concordance correlation coefficient to evaluate reproducibility. Biometrics 1989 Mar;45(1):255-268. 13. Lin L. A note on the concordance correlation coefficient. Biometrics 2000;56:324-325. 14. Beiske KK, Kjelsberg FN, Ruud EA, Stavem K. Reliability and validity of a Norwegian version of the Epworth sleepiness scale. Sleep Breath 2009 Mar;13(1):65-72. 15. Izci B, Ardic S, Firat H, Sahin A, Altinors M, Karacan I. Reliability and validity studies of the Turkish version of the Epworth Sleepiness Scale. Sleep Breath 2008 May;12(2):161-168.